"There are many really good bands who never manage to succeed, so it's nice to see one of them climb to the top of the charts, and know that you've been part of that process," says Andy Green, reflecting on the rags-to-riches story of Keane's Hopes And Fears album. "I always thought they had really good songs that could potentially appeal to my dad, my girlfriend or a teenager, and the record could sit on that fence between a number of genres if it was put together in the right way." Andy has obviously succeeded in finding that 'right way', as UK and European sales have proved. What's more, the album's cleverly layered piano lines and soaring vocals sit so comfortably the with drums, bass and synth parts that it's hard to imagine Hopes And Fears being produced any other way. Nevertheless, two years ago, the Keane trio — vocalist Tom Chaplin, pianist, bassist and keyboardist Tim Rice-Oxley, and drummer Richard Hughes — had never met Andy, and were busy making an album in a very different style. Keane had previously attempted to make their debut with the help of programmer James Sanger, who lent the band his studio in France, but although the recording was strong enough to secure them a publishing deal with BMG, a record contract was not forthcoming. According to Andy, the Keane/Sanger productions were extremely electronic, sounding more like the Pet Shop Boys than a live band. However, still in search of a recording contract, Keane decided to try to capture more of their live sound, so they began to produce new demos and alternative versions of the Sanger-assisted productions. This time around Tim Rice-Oxley took charge, using his home studio and Emagic Logic Audio to do the recording. Tim's efforts contained fewer electronic elements, and were based around a drum track created by sampling kick and snare from Richard Hughes' kit. 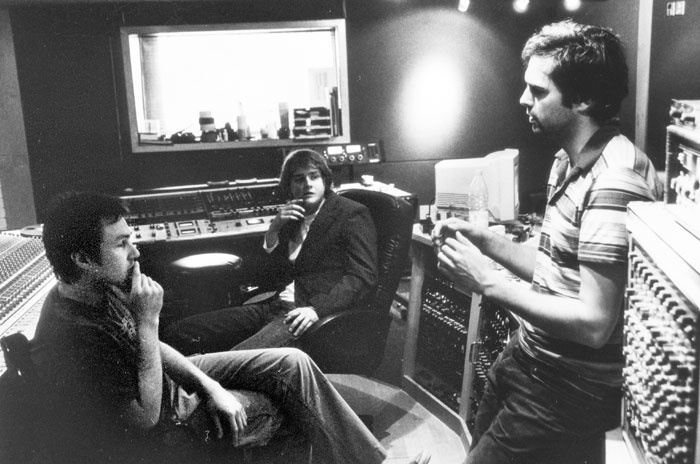 The demos soon found their way in to the hands of Tom Campion who, at the time, was responsible for A&R at Faith And Hope records, and had expressed an interest in the band. Among the label's other signings were a band called Alpinestars, who had recently worked with Andy Green, and it was this connection that led to his eventual collaboration with Keane. "Having produced the Alpinestars about three or four years ago, I knew band member Glyn Thomas, and he knew Tom Campion through the record label. Glyn 'phoned to tell me about this great demo he'd got from Tom and to say that he thought I'd be perfect to produce them. At the time, I didn't give it a second thought, but eventually Glyn sent me the demo and I was pleasantly surprised. "I got sent two CDs. One was all the very early electronic Keane/Sanger stuff, and the other was a later CD of tracks they'd recorded themselves, with some real drums and little or no electronic elements. It was still quite basic at this point, and there was little or no real piano. I remember that Glyn had carefully starred his favourite tracks. 'Everybody's Changing' had two stars so I listened to that one first, and I think I played it about 10 or 15 times back to back. I just thought it was an amazing song. The vocals were fantastic and I was very impressed by the structure, which was already in the same format as the final album version — actually some of the verse and chorus vocals from that demo made it onto the album. I don't remember listening to any of the other tracks for a least another week or so. "Just after I got the demos, the band released a self-produced version of 'Everybody's Changing' through Fierce Panda Records. Jo Whiley at Radio 1 heard it and played it a couple of times on her show. Suddenly all the major labels became interested, and the band were caught up in a bidding war." Needless to say the band never signed to Faith And Hope, although Tom Campion did manage to get a copy of Andy's showreel to the band. 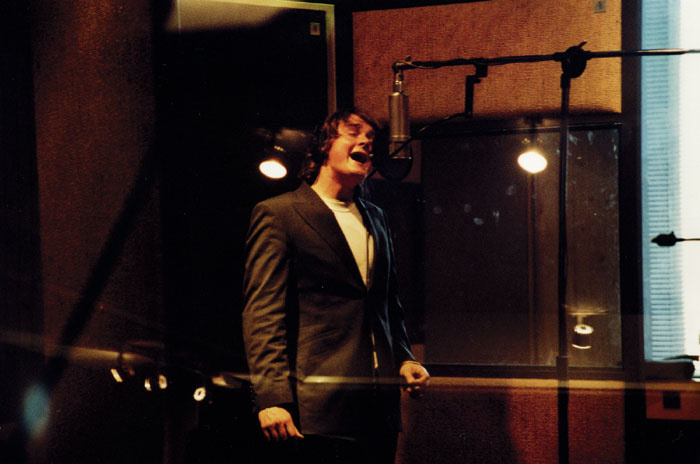 Tom Chaplin testing vocal mics; a Brauner VM1 was the eventual choice.Andy explains how he coaxed the best performance from vocalist Tom Chaplin. "Vocalists often sound fresh for the first two takes because they are not thinking about what they're doing, but they're also not properly warmed up. By take three, four and five, and certainly six, they are warmed up, but by then they're thinking too much about it. So by that stage it's a good idea to take a break for half an hour. By the time you go back in they're still warmed up, but no longer thinking about what they are doing. Working like that you get the freedom of takes one and two, together with the silkiness and smoothness of the vocalist when they're warmed up. There were usually three or four takes when Tom was 'in the zone', and those were the ones from which I comped the vocal." 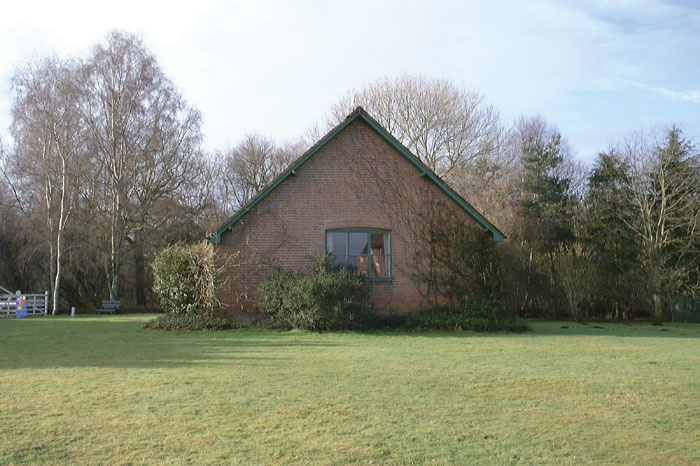 Andy's first meeting with Keane was at their rehearsal studio in Battle, East Sussex, which actually turned out to be a spare room in the house of Tim Rice-Oxley's parents! "All their gear was packed into this tiny room where they recorded and rehearsed," explains Andy. "I think they were a bit apprehensive about having someone come to hear them play. Adam, the band's manager, told me that the next step was to record an EP, again to be released by Fierce Panda, in an attempt to try and capture the band's live sound. They thought that none of the recordings to date had anything like the amount of energy that was present at their live shows." Fired up by the band's enthusiasm, and encouraged by what he viewed as a lack of pretension, Andy agreed to help them produce some tracks. 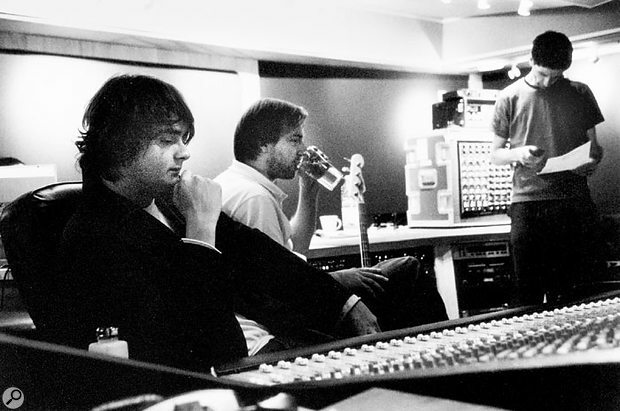 In June 2003, Andy and the band were booked into Westside Studios and began work on the three tracks which formed the 'This Is The Last Time' EP. Distributed to the media, these songs gained yet more airplay, becoming Jo Whiley's Record of the Week. 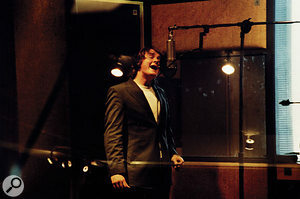 Keane then signed a deal with Island Records, who immediately supplied the financial resources for a new recording programme with Andy as producer. "They have a fantastic old desk there from a company called Helios. I think it dates back to the early '70s. Half of it came from SARM Basing Street and half was once owned by the country guitarist Alvin Lee. When it was put together it got completely rewired so all the pots and faders are good." 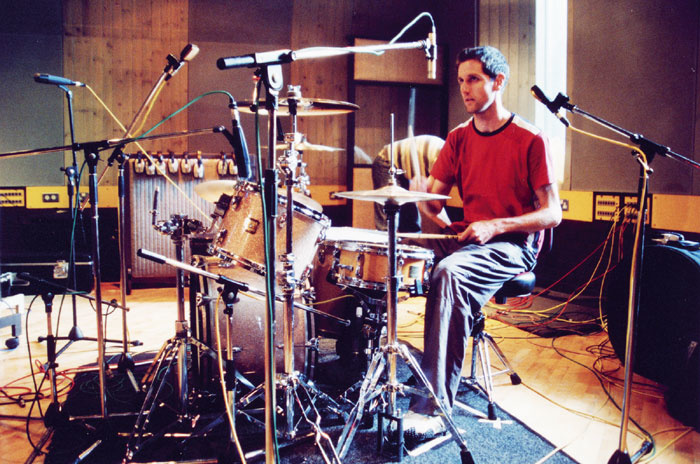 From the start of the Helioscentric recording sessions, the team's plan was to record new drums, vocals, piano parts and bass lines, using the large Keane library of demos as a compositional basis. However, first of all, Andy had to load all the previously recorded material into Pro Tools. "There were a ridiculous number of versions of some of the demos!" he recalls. "Tim had recorded all of his work in Logic Audio and had used a few Logic soft synths, so he bounced everything down as audio files and gave me the demos on a Firewire drive so that I could import it all into Pro Tools. I ended up with as many as 30 tracks of audio for some songs before we'd even recorded anything fresh! It was quite a lot of stuff to plough through but I think you have to start with everything to know where a band is coming from." 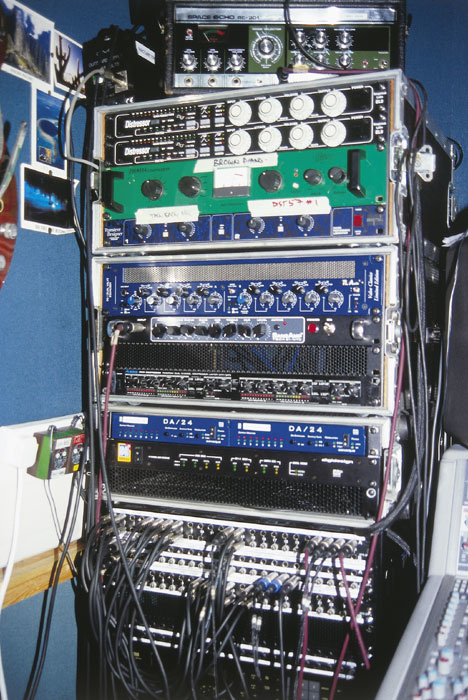 Having everything ready in the Pro Tools rig meant that Andy could send any compositional element, besides the standard click track, to the band's headphones whilst they were recording new parts. However, rather than recording all the new material directly into Pro Tools, Andy chose to use two-inch, 16-track analogue tape for the drums, running at 15ips and with Dolby SR engaged. "I still think two-inch is best for drums," explains Andy. "Whatever drum sound you've created, it always sounds better from two-inch than with the machine on input. Tape, especially running at slower speeds, seems to give the drums and bass a chunkiness that you just cannot match by recording straight into Pro Tools. I've recorded drums straight to Tools on a number of occasions and they just don't seem to sound as cohesive as recording to tape. "The two-inch and Pro Tools were timecode-locked, which enabled the click track, demo bass, and a synth here or there to be sent to the cans whilst tracking." 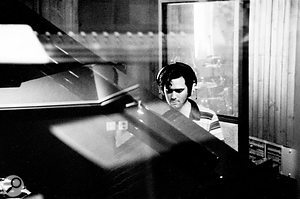 In the studio, Rice-Oxley had his Yamaha CP70 piano set up in the same room as the drum kit, while vocalist Tom Chaplin performed from a small vocal booth. All of the band members could see each other whilst playing. 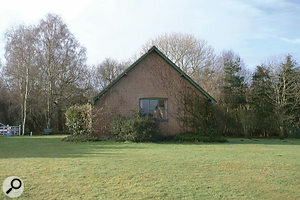 Andy oversaw the recording process from the control room which housed the Helios desk and various outboard processors. Andy's first priority was to get a good set of drum takes on tape; however, all three musicians played together and were recorded as a live band. Ultimately, many of the vocals were redone, as were most of the CP70 parts, but some material did survive from those live tracking sessions: "Sometimes we used a bit of live piano or vocal if it worked. A lot of 'Somewhere Only We Know' is actually live vocals. The isolation in the studio wasn't great, so if you listen to the vocal comps from those sessions you can hear drums and likewise you can hear piano on the room mics around the drums. That's part of recording live for me. I think the worst isolation was between the control room and the live room, because it didn't have a proper soundproof door, it's basically a door with glass in it. Things like that didn't stop it being a wonderful studio to work in, though." At first, Andy took particular care to establish the right kind of drum sound, and to expand on the minimal rhythm tracks from Tim's Logic demos. "I often spend quite some time fiddling with the postioning of drum mics, and will usually record far too many mics as opposed to too few. I'm not necessarily going to use all the mics but it just gives you the option to do so at a later stage. With a lot of Keane's songs it was important to be able to reduce the levels of the room mics around the kit in order to dry out the track for the verses and then increase the room levels for the choruses, in order to help the track increase in size. All the mics were recorded to separate tracks, which would typically fill up the 16-track. I would then record the vocals and piano straight into Pro Tools. "After the live takes were completed I'd copy the tape parts across into Pro Tools and have all the live takes as playlists in the computer. That way it's dead easy to edit between takes and move things around. "I think I put an AKG D112 mic on the bass drum and SM57s on the snare, above and below. I've never really understood the need to reverse phase on the snare mics — if there's a problem I just move the mic a little and it sounds fine. A number of times I've thought I'd better reverse the phase and then preferred it the other way round! There are lots of rules like that which are useful to know, but you've just got to listen I think. "I also put an AKG C451 on the hi-hat, Neumann U67s on the overheads at 90 degrees to each other, and maybe a Sennheiser 409 ribbon mic on the ride. For the toms I used Sennheiser 421s, and then there would have been about six room mics including two figure-of-eight-pattern Coles 4038 ribbon mics." Andy also made extensive use of distorted and effected mics which were scattered about the kit in various formations. "I have an old 1970s Sony chrome-fronted domestic cassette recorder, which has an auto-level limiter setting. It has two mic inputs on the front, and a stereo output on the back, and it sounds absolutely fantastic on drums. I also had an API four-channel mic amp with a few SM57s plugged into it, turned up full so that it was really distorting, and I would probably have placed a Neumann FET 47 above the kit pointing at the snare, and compressed it heavily with a UREI 1176. I would often pan the more unusually positioned mics fully left and right in an attempt to make the drums sound as wide as possible. I always try to get the drums sounding right for the song at the time of recording, so If I'm distorting a mic by tuning a mic amp up full or something, there is often quite a lot of EQ going on in order to get that mic to blend properly with the rest of them." Perhaps the most striking thing about Hopes And Fears is its total lack of guitars, which is particularly unusual for a three-piece band recording traditional pop songs. According to Andy, "there was never really any discussion about adding guitars. I personally saw it as a bit of a challenge from a production point of view, to make a record which didn't have guitars but still sounded like a band." Taking the place of the guitars in the arrangements are Tim's piano parts, played primarily on his Yamaha CP70. The instrument had proved adequate for the band's live shows, so it seemed the natural choice for use on the album, but its shortcomings made production difficult for Andy, as he explains. "The CP70 has real strings but it also has some kind of pickup rail inside so you plug it in rather than mic it up. It's quite bass-heavy, doesn't have much high end, and sounds quite hard, plus the output is mono. This worked well on tracks such as 'Can't Stop Now' where a more edgy-sounding piano was required, but wasn't right for all the songs. The natural thing to do was layer the CP with a good real piano sound, so we tried the grand pianos that were resident at Heliocentric. "One sounded better than the other, so the natural thing to do was to use the good one, but that didn't work with the CP70. The other grand worked much better because it was quite bright, and that made up for the CP in the top end. The real piano didn't sound amazing on its own, but together with the CP, and panned out a bit, they seemed to work well. I don't know who the piano manufacturer was, but it became known as the brown piano! I don't even think it belonged to the studio — a mate of Chris Difford's was storing it there!" Andy recorded the 'brown piano' using two Neumann valve U67s placed parallel to the sound board, and at 90 degrees to one another to help avoid phase problems. One was positioned at the high end and the other at the low end, and both were compressed using a Joemeek SC1 stereo compressor. "Tim would often play some sort of pad-like keyboard sound in the chorus to make it open out and sound bigger, and we'd usually record string sounds from a Siel or Solina string machine. Both of those instruments are quite bright and synthetic-sounding, but if you roll off the top end they begin sounding warmer. Tim often played those parts twice so that we could pan them left and right to get some stereo, and sometimes it may have been a case of layering the Siel and the Solina. I think Tim also played some strings from the Logic sampler. Just like the piano scenario, none of the string instruments sounded particularly good in isolation, but in combination they sounded much more interesting than you might expect. I think a lot of the record works because of layering sounds. "There are also a lot of Juno sounds in there, particularly in 'Everybody's Changing', and a lot of those sounds were taken from the very early demos. Those demos were all programmed and had lots of rhythmical sequenced synth sounds. I feel that those sparkly sounds make the record seem a bit more glossy and radio-friendly. You only have to add a few and it suddenly opens it out into a completely different musical area. We also had a lot of success with a Hohner Pianet piano which we played through the Amp Farm plug-in in Pro Tools, and then filtered with Filter Freak to make it sound like an old synth or something." Despite the success of the dual-piano combination, Andy was still concerned that the general sound of the pianos was too clean and traditional, and realised that the tracks needed a little more power in the lower ranges. "I kept thinking that it all sounded a bit too nice," admits Andy, "but the turning point was when we treated the piano like a guitar, and put it through a guitar amp. We used a tiny green 1x12 guitar combo whose name escapes me. We didn't want a meaty 4x12 sound, it just needed to fill out the track slightly and make it sound a little more aggressive. Sometimes I sent the 57 and/or the CP70 DI back through a Sansamp bass preamp if the amp wasn't enough. I also used the Samsamp and Amplitube plug-ins from Pro Tools on the piano, drums and synths from time to time. "We usually had the amp quite loud, and at one point I remember taping the mic to the amp so that we could hit it against the piano to get feedback. Another time we had some sort of delay going on and Tim was actually plucking the piano strings so it sounded a bit U2-like — there was a lot of experimenting." 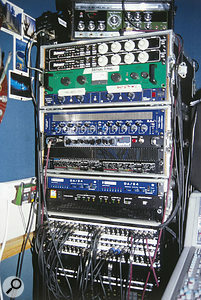 Andy's portable gear rack, including (from top) Roland RE201 Space Echo, Empirical Labs Distressor compressors (x2), the Joemeek SC1 compressor used on the 'brown piano', SPL Transient Designer dynamics processor, TL Audio EQ1 equaliser, Tech 21 Sansamp amp simulator, Alesis 3630 compressor, Sonorus DA24 D-A converters (x2) and Digidesign ADAT Bridge interface.Photo: Tom FlintAfter the discovery of the guitar amp effect, many of Tim's piano parts had to be replayed. This time they were recorded via the green guitar amp, although the aforementioned delay effect was only used for monitoring, and was added to the recorded tracks at a later stage. "At first we did try sending the recorded stuff to an amp, but the trouble with Pro Tools is that you get a latency problem because the D-A conversion takes a bit of time. You can re-align the audio but you still tend to get a phased sound. On 'Somewhere Only We Know' we did send the piano out to an amp, and I did offset the audio quite a bit in order to get a sort of slap-back echo between the clean piano and the amped sound." Although Keane had successfully replaced the role of the guitar with their innovative piano arrangements, they still lacked the input of a bass player. Fortunately, this proved less of a problem, thanks to Tim's synth programming and bass-playing skills. "Sometimes Tim played real bass, but if the structure of the song was the same as the demo we found that we could often use bits of the more interesting synth bass. On the track 'This Is The Last Time', the verses are demo bass from the France recordings three years ago, and the choruses were replayed by Tim on a real bass guitar. For most of the tracks the demo bass was erased because the real bass made it all sound a bit more 'band-y'. The way he plays the bass is like an extension of his piano playing, and it seemed to glue the songs together. He'd often pick up the bass and play the right thing straight away, maybe with just the odd note I had to nudge into time. "I DI'd the bass using a Tube-tech MEC-1A channel strip, which I also used for vocals. I'm quite into just DI'ing basses and using amp simulation like the Sansamp, as opposed to recording with a bass amp. Also, you more often than not get phase issues with an DI and amp combination." Tom's vocals were recorded through a Brauner VM1 mic and the same Tube-tech channel strip. "The Brauner/Tube-tech combination was really good," enthuses Andy. "It was the same unit I used for the bass guitar, so I was always having to readjust the controls. Generally, I applied a bit of compression, and a load of top EQ. I quite like using EQ while recording. If something sounds a bit dull at the recording stage you may as well EQ then as opposed to later, especially when you have a nice bit of kit like the Tube-tech to hand. Besides, we didn't have that much analogue outboard and the Pro Tools plug-ins don't sound as good." 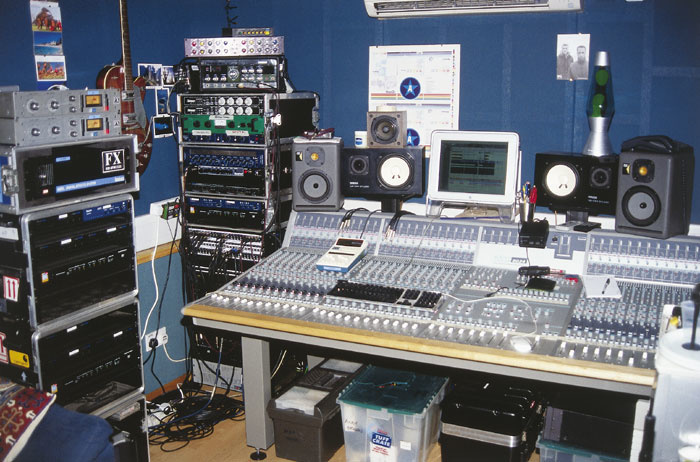 All the audio editing for Hopes And Fears was done by Andy using Pro Tools software, partly during the recording sessions at Helioscentric, and then afterwards at Andy's own small room in the basement of Townhouse Studios in London, which houses his new Audient 8024 console. "Sometimes we would record in the evenings, but mostly I would be left to edit and compile and arrange parts recorded that day. For example, we had to listen carefully to Tim's live piano and decide whether or not we needed to embellish it or scrap it for a more orchestrated piano arrangement. Often we would split up pianos into areas of the keyboard, sort of like a low-pass, mid-pass and high-pass. If there were two or three countermelody ideas going on we would try things like putting one in the first chorus, another in the second, and then both in the last chorus, so the track felt like it was growing. The band would tend to let me have a fiddle with those sorts of things and then they'd listen to what I'd done and make further suggestions. "Pro Tools is a great tool for quickly editing and trying out arrangement ideas. It only takes a few seconds to move something to see if it works in another place, and you can easily nudge multiple tracks of audio, which is still something you can't do as easily in Logic. A lot of the time we were layering piano over piano, so it has to be exactly in time with the original part otherwise it just sounds a mess. There was a lot of nudging phases or even notes around in Pro Tools, not because Tim's playing was bad, simply because if you're not exactly in time with the other takes, the effect of layering the sounds disappears and it all sounds a bit chaotic. "I've been asked if there's more than one piano at the start of 'Somewhere Only We Know', when in fact there's four, and three amp tracks all playing at the same time, but all chopped about in Pro Tools to make them sound precisely in time. There are low bass notes and single melody lines similar to what you might play on a guitar. If you listen to the track's intro you can hear Tim playing low chords at first, and then halfway through he starts playing a guitar-amped higher-note line which comes in under the cymbal crash, and that makes the track lift up a gear. "Also, at the beginning of 'Bend And Break' you can hear a bass line, but just above that Tim is hitting really low notes on the brown piano. He's playing quite hard and they're compressed viciously. Tim purposely didn't play too low on his CP to leave a bit of space for those sorts of bass piano parts." On completion of the recording part of the project, everyone involved took monitor mixes home over the Christmas break so that they could decide what further editing needed to be done. In the New Year, a further three weeks were spent in Andy's Townhouse studio 'tidying up' the tracks in preparations for mixing by Mark 'Spike' Stent at Olympic Studios. "At that stage we weren't recording," says Andy. "If anything, we'd recorded too many different parts, so we were just arranging what we had already recorded. Often you listen to your work the day after and something still sounds a bit weird — the way that chorus drops in to that verse or whatever — so we created quite a few different arrangements for each track. When we hit upon something we thought was good, I'd do a monitor mix of it and send it — together with a Pro Tools file — over to Spike." The album was mixed on Stent's SSL 4000G console in his studio inside Olympic Studios in Barnes. "He mixed very fast," says Andy, "at least a track a day." Having written much of Hopes And Fears two years earlier, Keane already have a number of new songs in hand for their next album, which is most likely to emerge some time next year. In the mean time, the band are busy touring the US and Europe to promote Hopes And Fears, having turned down a slot as supporting act on Dido's tour of the States in order to try to make it on their own. 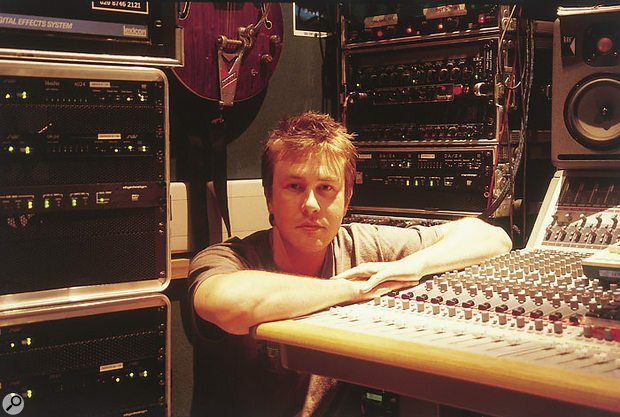 Andy is currently working with American band Joy Zipper, KT Tunstall, and mixing a Honey Riders album. As for the next Keane album, "nothing has been decided yet. I may be involved I may not, I know they have a lot of material already written, there may be a guitar here and there, who knows. We'll have to wait and see."